27 September 2017— A comprehensive study of faults along the north side of the Olympic Mountains of Washington State emphasizes the substantial seismic hazard to the northern Puget Lowland region. The study examined the Lake Creek-Boundary Creek and Sadie Creek faults along the north flank of the Olympic Mountains, and concludes that there were three to five large, surface-rupturing earthquakes along the faults within the last 13,000 years. The study published September 26 in the Bulletin of the Seismological Society of America estimates that the two most recent earthquakes on the faults, one occurring around 2900 years ago and one occurring 1300 years ago, were likely of magnitude 7 and magnitude 6 to 7, respectively. Based on an analysis of fault scarps mapped with airborne lidar imagery (a remote sensing method used to examine the Earth’s surface) and the dating of earthquake stratigraphy in trenches, fault slip rates are about one to two millimeters per year, and as much as 56 kilometer lengths of the faults may have ruptured during earthquakes. While the presence of large earthquakes in the region is not surprising, given the ongoing tectonic deformation in the region, said Alan Nelson and Steve Personius of the U.S. Geological Survey, the Lake Creek-Boundary Creek fault, and other young, active faults like it, pose a significant earthquake hazard for the northern Puget Lowland region. The Puget Lowland includes Seattle and extends through western Washington from Bellingham in the north to Olympia and Tacoma in the south. The threat of a magnitude 8 to 9 megathrust earthquake and tsunami in the Pacific Northwest at the Cascadia subduction zone offshore, where the Juan de Fuca tectonic plate is pushed underneath the North American plate, often steals the seismic hazard spotlight in the region. But much shallower, upper-plate earthquakes also can produce strong ground shaking and damage. At least nine active upper-plate faults, like the Lake Creek-Boundary Creek fault, have been documented in the Puget Lowland, said Nelson. The researchers studied airborne lidar imagery collected in 2002 and 2015 to identify fault scarps along the heavily forested areas of the Lake Creek-Boundary Creek and Sadie Creek faults. Mapping and dating of the stratigraphy in five trenches across scarps of the eastern section of the fault shows that there have been at least three earthquakes over the past 8000 years, and the lidar mapping also shows evidence for multiple earthquakes on the western section of the fault. To gain a better understanding of the age, number, and magnitude of earthquakes on the faults, Elizabeth Schermer at Western Washington University and her colleagues plan additional trenching of fault scarps and coring of swampy areas along some scarps later this year. The new BSSA study suggests that the Olympic Mountains have been moving westward, relative to the Coast Range and Puget Lowland, since the late Pleistocene, said Schermer. 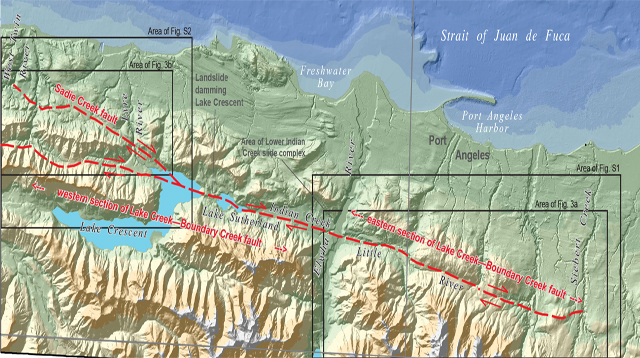 Under this scenario, although an accretionary wedge in Earth’s crust underneath the Olympic Mountains is being pushed eastward, the mountains also form a triangular block between the Lake-Creek-Boundary-Creek fault on the north and faults on their southeast flank. Because the Olympic block is being squeezed between the northward moving Oregon Coast Range and Vancouver Island, the block moves or “escapes” westward. The two types of movements working together produce the uplift that created the mountain range, she noted. This westward “escape” model for the Olympics “predicts different rates of slip and therefore different sizes and frequencies of earthquakes on the other faults that interact with each other in the region,” said Schermer. Data on the history of the Lake-Creek-Boundary Creek fault and others in the region can help seismologists test their models of how the dynamics of the Cascadia subduction zone and the northward movement of the Oregon Coast Range may affect upper-plate earthquakes in the Puget Lowland. “We’re looking at one small part of a complex jigsaw puzzle with the Lake Creek-Boundary Creek fault, but we need to figure out slip rates and earthquake histories on a lot of different pieces to really be able to put it all together,” Schermer said.